West Nile virus (WNV) is an infectious disease that first appeared in the United States in 1999. Infected mosquitoes spread the virus that causes it. People who get WNV usually have no symptoms or mild symptoms. The symptoms include a fever, headache, body aches, skin rash, and swollen lymph glands. They can last a few days to several weeks, and usually go away on their own. 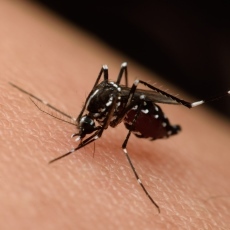 If West Nile virus enters the brain, however, it can be life-threatening. It may cause inflammation of the brain, called encephalitis, or inflammation of the tissue that surrounds the brain and spinal cord, called meningitis. A physical exam, medical history, and laboratory tests can diagnose it. Article: Comparative fitness of West Nile virus isolated during California epidemics. Article: Scaling of Host Competence.